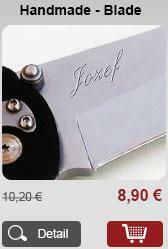 The Internet shop is provided by company Euro-Knife Ltd. The company is registered in the Commercial Register of the District Court Košice I, Section Sro, insert the number 30561 / V.
Monday to Friday 9:00 to 17:00 pm. 1 To find out the shipping cost of your order, please add items to shopping cart, proceed to the shopping cart and select your country, shipping method and payment method. The system will then calculate your shipping costs and the total cost of your order. Customs fees, duty taxes and import fees are the customers responsibility. We guarantee delivery up to customs. Past that is the customer's responsibility. We are not responsible for confiscation, loss or theft at customs. All items are declared and insured for their full value. 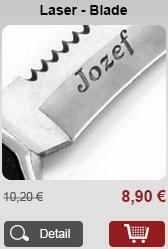 Generally this means "Folding Knife" or similar on the customs declaration. No Exceptions. No Returns on International Orders except European Union countries. Warranty issues and defects must be dealt with directly with the manufacturer. We provide you with shipping costs for a variety of shipping methods while you are shopping and during checkout. Our shipping prices are based on the exact quote of major shipping companies to ship from the warehouse to your address. We do not make a profit on shipping. International Orders We can only guarantee the safety of the merchandise in transit up to the point that your country’s customs office receives the package for inspection. After that point, we have no way to guarantee the clearance of the item through customs, or delivery via your postal system. 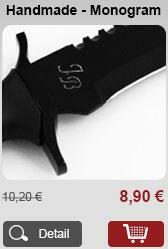 ​​​​​​​Euro-Knife offers no legal advice regarding laws applicable to your purchase of Products. We have provided general information herein to you of EU UNION laws that may affect your purchase. It is your responsibility, as the buyer, and not Euro-KNIFE, as the seller, to ascertain and obey all applicable international, federal, state, and local laws regarding your purchase and use of knives,switchblade knives and disguised knives. A switchblade is any knife resembling a pocketknife with a blade that can be released automatically or by use of a trigger. Other names for switchblades include spring-blade knives, snap-blade knives, gravity knives and butterfly knives, disguised knife is a knife designed to look like a harmless item. Examples of disguised knives include belt buckle knives, cane swords, shobi-zue, lipstick case knives, air gauge knives and writing pen knives. You must be at least 15 years old to order any knife Products and at least 18 years old to order restricted products in some countries. Some items on the Website may be illegal in your Country or other areas for possession by those under the age of 15 or 18 or 21 or restricted . You shall be responsible to check all applicable federal, state, and local laws concerning the purchase, ownership, use, and possession of any Products sold to you on the Website. To make order you agree with this conditions in full range. 2 Customer (buyer) in the online store means any natural or legal person who sends an electronic form to order goods (product / s or service / vices). 3 When ordering a physical person - non-entrepreneur please state your full name, address where the goods are to be delivered, phone number and e-mail. If you are buying as a legal entity (the company or business) in order also enter your business name, company registration number / VAT number and billing address if different from delivery address. 4.K acceptance of orders of goods by the operator and therefore the purchase contract shall be made upon confirmation of correct and completely filled orders electronically (e-mail) by the operator, ie change the order status to status "processed" After submitting your order to you the specified e-mail will be sent confirmation of the order and later further information about the status of your order (eg order has been processed, the goods have been dispatched, the product is currently sold out, etc..). Order registered customer you can check directly in on-line mode on the website shop after login. 5 The place of fulfillment of the contract of sale shall mean residence (domicile) or place of business of the customer in electronic form with the order. The goods will be supplied by the operator using the services of third parties (contracting carrier, courier service) or operator shall deliver the goods by its own means or by agreement with the customer the goods will be ready for handover to the operator. Delivery of goods is effected by handing it over. Title to the goods passes to the customer when the goods under the pen upon payment of the amount stipulated in the purchase order in full. By the time the ownership of the operator to the customer, the customer shall have any obligations and custodian things is to products and services at their own expense safely keep and mark them so that they are at all times identifiable as the goods of the operator. 6 The operator shall deliver the goods to the Customer as soon as possible after receipt of an electronic order form with the delivery times listed on the website operator. The Customer acknowledges that delivery dates indicated (delivery time) are indicative only. Buyer agrees to extend the delivery period when it ordered production of goods or other circumstances require. If the operator is unable to supply the goods ordered all the agreed date, it shall notify this situation as soon as possible and notify his client expected delivery of goods ordered or he will propose substitute goods. If the customer orders goods of non-standard dimensions or items heavier than 30 kg, the operator shall arrange payment and delivery with the client individually. 7 If the goods are delivered to the contracting carrier, the customer gives the operator the right to provide contract carrier necessary personal data for the purpose of delivery (name / business name, address, phone). 8 When receiving the goods the customer will receive a receipt of goods, which is also a proof of purchase of goods for payment on delivery. Evidence of transposition of goods is also an order of goods in writing. The tax document with the quantification of the purchase price the customer will receive an e-mail within 14 calendar days of receipt of goods. All listed prices are final. We are not VAT registered. 9 If the buyer does not pay and does not take the merchandise out of the situation of damage goods on delivery (mail is returned as nedoručná no fault of the operator, for example., If a carrier addressee found, notifies about delivery, customer shipment inadvertently or deliberately not taken, etc..) operator may claim damages caused by the breach, covered by a penalty. Liquidated damages in this case, set the minimum amount of paid postage and a maximum of 20% of the total price of the order. Customer who assumed order will be sent an e-mail message with the request for information, what to do next with his order. To respond to this challenge, the Client 7 days from the date of dispatch of the message. If the client requests a resend returned the following items, the operator received previously to the total price of the consignment second handling fee and postage according to the valid price list. Reissue of the following items can be returned only on payment in advance. Unless the customer to call the operator does not respond within a specified time period, the order will be canceled by the operator. 10 Customer as a private person (Non-Business) is in accordance with the law to withdraw from the contract within 7 working days of receipt of goods. In this case, the client contacts the prevázdkovateľa and send it no later than the last day (just submit for posting) or within the specified period personally deliver a written statement (not electronic means of communication) of withdrawal stating the order number, purchase date and account number or exact address for financial settlement. Consumer purchaser immediately return purchased goods in the original condition as when taking over (including documentation, accessories, etc..) Client send at their own expense (only where the quality requirements and was not defective) along with the original sales receipt back to the address operator (but not by cash on delivery). Prevázdkovateľ undertakes to refund to the Customer the price paid for the goods within 15 calendar days from the date of termination in the same manner as that used for payment of the goods, unless the customer requests otherwise. In case the returned goods damaged, used, worn or incomplete, the operator can return to the Customer the purchase price less the amount of damage or deterioration of the goods in the amount min. 1% of the total price of the goods (in accordance with the relevant provisions of § 457 of the Civil Code). 13 If the customer is currently located or living abroad, the operator agreed payment and delivery with the client individually. For delivery of orders to the CR client pays the price of goods and services courier in translation at the current rate of £ by the National Bank of Slovakia (www.nbs.sk). 14 Warranty conditions are adjusted claim regulations . 15 Operator is not responsible for late delivery of goods caused by the postman (mail, courier) or giving the wrong address customer. The client must thoroughly check the goods when it is downloaded from the bearer's signature and confirm the receipt of goods for a receipt of goods. If the shipment is visibly damaged or destroyed, the customer is required to free the lot immediately contact the operator. Any claim for non-delivery due to damage to the bearer or goods caused by process server is required in such cases directly to the postman. Claim mechanical damage caused by goods transport, download the client free from defects confirmed officers, operators will not be recognized as legitimate and implementation of such a claim will not be provided to Customer's. 16 The operator has the right to cancel the order in case of non-delivery due to force majeure, due to the end of its production, because its sold out or because of inability to supply the price that is listed in the online store, in all these cases, the operator shall notify the customer. The operator shall provide an opportunity for the delivery of replacement goods. The customer has the right to refuse to supply substitute goods and withdraw from the order of the goods. In the case of payment of the purchase price or part thereof will be in the order is canceled funds returned to the customer within 15 calendar days in the same manner as that used for payment of the goods, unless the customer requests otherwise. 17 The Customer declares that he agrees to sec. § 7. 1 of the Act. 428/2002 on Protection of Personal Data as amended, the operator and keep the processed personal data, in particular those listed above, and / or which are required in the operator's activity and process them in all of their information systems. The customer gives the operator the agreement for an indefinite period. Consent to the processing of personal data, the customer may at any time revoke in writing (e-mail, registered mail) or by telephone, whereupon the operator's personal information deleted from its database. Updating of personal data registered customer can place directly in on-line mode on the website shop after login. 18 Client after submitting your order, or registration may receive messages about offers products, events and services vendor. The Customer may withdraw at any time through the transmission line, which is located in the e-mail that will be delivered to him. 19 Trade relations (as well as other legal relationships which may arise therefrom) with individuals not acting in concluding trade agreements under these Terms and Conditions as part of its business, shall apply in addition to the general provisions of the Civil Code and special rules, in particular Act No. . 108/2000 on consumer protection in doorstep and distance selling Act. 250/2007 on consumer protection. 20 The customer and the operator agree to fully accept electronic forms of communication, especially through electronic mail and the Internet network as valid and binding on both parties. The electronic form of communication is not acceptable in the event of withdrawal from the contract. 21 Client sending an order confirming that the following Terms and Conditions read and fully agrees with them. Notwithstanding the other provisions of these Terms and Conditions, the operator shall not be liable to the Client for loss of profits, loss of opportunity or any other indirect or consequential losses due to negligence, breach of contract of sale or otherwise incurred. Where to demonstrate to the competent authorities of the Slovak Republic Certain provisions of these Terms and Conditions to be invalid or unenforceable, in whole or in part, the validity and enforceability of the other provisions of the Terms and the remaining provisions of the Terms remain unaffected. 22 Terms and Conditions apply as stated on the website of the operator on the day of dispatch of an electronic form with the order except where the two parties expressly agreed otherwise. We reserve the right to change these Terms and Conditions. Obligation written notice changes GTC is met by placing the website trade. These Terms and Conditions are valid from 26.02.2013 and fully replaces the previous VOP. We reserve the right to change the Terms without prior notice.